Has your Quantum Heat Pump Hot Water System stopped producing hot water? We have the expertise to repair most problems with these units promptly. Quantum Heat Pump Hot Water Systems are Australia’s leading manufacturer of advanced renewable solar energy hot water heat pumps. ‘Solar’ hot water with no roof panels! Replacing an inefficient hot water heater is one of the most significant low cost, carbon reduction opportunities available to the consumer today. Most people are aware of the three main ways to produce hot water for the home: electric, gas and solar. The fourth is the energy and cost efficient Quantum heat pump. 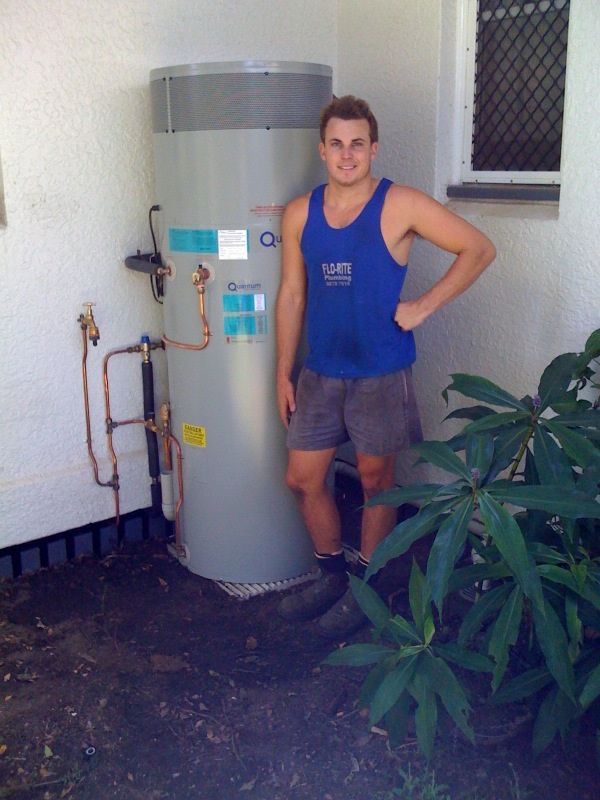 Installing a Quantum heat pump is almost identical to an electric water heater. There are no solar panels or special requirements, ensuring a simple and easy conversion to sustainable hot water for your home. Simply remove your old electric heater and replace it with a Quantum. producing hot water the largest source of greenhouse gas emissions in the home. cost to produce hot water by up to 75% when compared to other hot water systems. The Quantum 270 Litre Compact hot water heat pump is a market leading blend of performance, capacity and flexibility. Delivering outstanding performance for domestic hot water applications the Quantum 270 litre delivers real energy and cost savings compared to traditional water heating modes, i.e. gas/ electric and boosted solar. The Quantum 340 Litre Compact hot water heat pump is a market leading blend of performance, capacity and flexibility. Delivering outstanding performance for domestic hot water applications the Quantum 340 litre delivers real energy and cost savings compared to traditional water heating modes, i.e. gas/ electric and boosted solar. Our service vehicles are fully equipped to carry out hot water replacement and repairs to Quantum Heat Pump Hot Water Systems, Hot Water Heaters, Hot Water Tanks and Hot Water Units. We are fully Licensed and Insured Solar Hot Water, - Gas Hot Water Service, - Heat Pump and Electric Hot Water Service specialists as well as Plumbers, Drainers and Gas Fitters. All of our trade staff have Plumbing, Drainage, Electrical and Gas Fitting Licences.